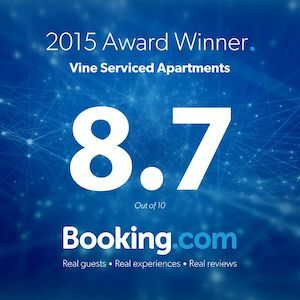 VINE SERVICED APARTMENTS offers both corporate and holiday accommodation, each with a balcony plus FREE unlimited WiFi, FREE car parking and Foxtel IQ in SOUTH BANK, BRISBANE - with a choice of daily, weekly and monthly rates. Offering an amazing lifestyle, award-winning Vine Apartments is located overlooking Musgrave Park, at the intersection of Russell and Cordelia Streets; around the corner from the Brisbane Convention and Exhibition Centre; near West End Shopping Centre, near South Bank cinemas, shops and two train stations, near the Queensland Performing Arts Centre, the Queensland State Library, the Queensland Museum, plus South Bank CityCat and near FREE City Hopper ferry terminals and a leisurely 15-minute stroll across Victoria Bridge to the CBD, Treasury Casino and Queen Street shopping mall. Consisting of 56 x fully air-conditioned boutique one and two-bedroom/2-bathroom luxury apartments, each bedroom has its own adjustable AC unit, plus kitchen stocked with crockery/cutlery and glassware. All apartments have at least one large furnished balcony, plus FREE WiFi and one FREE car park are included in nightly rates, European fittings with SMEG gas cookers, oven, huge 420 ltr fridge / freezer, quality cooking utensils, coffee plunger plus tea & coffee making facilities, dishwasher plus washing machine / clothes dryer, ironing board and iron. Residents also enjoy the luxury of two lifts - with security fob access, one secure car park per apartment used by residents only, a rooftop recreation area with a residents' BBQ and even an open-air heated rooftop spa overlooking Musgrave Park.